Junior racing can be some exciting, emotional stuff, and after a long summer of training, selection, more training, more selection, travel, and then what seems like days upon days of waiting, no one could fault a crew for getting a little fired up for the heats. The trick is to corral all that youthful energy into boat speed, and let off just enough steam in the heats to get yourself off on a good note, rather than doing something that scares your coaches, your teammates and yourself. It can be tricky for youngsters, but it can be done. Case in point: the US junior men's quad. The crew was quiet and serious at the starting line, but about six or eight strokes into the race, someone in the crew let loose a booming bellow that had folks on the pontoons laughing; another 10 strokes or so later, the same guy boomed "THIR-TEE SEV-EN!" in what had to be an even more forceful call, as it sounded as loud as the first one even though they were another 100 meters away. It didn't hurt the cause; the crew finished second in their heat with what looked like a good row; they'll need more as the regatta goes on, but it is job done for today on several levels – get the jitters out, come on strong in second 1000, throw out the loudest yell of the day's racing – good stuff. On the whole the US had a decent day in Hamburg, with only the men's double headed for the reps, and definitely highlighted by men's single sculler Ben Davison's win with the fourth fastest time of the day. After getting beaten up a bit at U23s a couple weeks ago, particularly at the start, Davison kept himself in the race in the early going, then stomped on it a bit after the 1000 to take the lead. Davison got off the line in second place behind France’s Maxime Ducret, but he cut the lead to just one second at the 1,000-meter mark and overtook Ducret moving into the final 500 meters. Davison crossed the line in a 7:34.21, finishing 1.92 seconds ahead of Ducret. Estonia’s Daniel Liik finished third, also grabbing a spot in the quarterfinals. A large number of international rowing careers got underway today, and they got a good taste of the different things that can happen at an elite-level international regatta – even senior team rowers who are rookies sometimes expect it to be a perfect setup, which we know doesn't really come together all the time. For example, a large patch on the forehead of the Danish women's sculler as the subject of guesswork from folks up at the line, the most likely supposition being that she walked into a rigger in the boatyards. And don't forget the cadences of one of the starters, who, after shepherding the crews into their lanes often with a singsong voice, and very calmly counting down five, four, and three minutes to racetime, suddenly seemed to become possessed as he sounded a harsh, growling and exceedingly severe "TWO... MINUTES!!!" Then the beep sent the crews off, and the demeanor of the sweet shepherd took over again to bring the next batch of crews to the line. In more US results, Elizabeth Sharis earned a spot in tomorrow’s quarterfinals with a second-place finish in her heat of the women’s single sculls. Sharis battled Cuba’s Ilianny Roman Olivera for the first 1,000 meters and was in a virtual dead heat with the Cuban as the two entered the second half of the race. After dropping off the pace in the third 500, Sharis came back strong over the final stretch but couldn’t catch Roman Olivera as the two crossed the line. The Cuban finished with a time of 8:38.99, with Sharis 0.39 seconds back in an 8:39.38. Australia’s Amanda Bateman finished third to also advance directly to the quarterfinals. After sitting in fourth place at the midway point of the race, the men’s quadruple sculls crew of Kenneth Michalec , Andrew LeRoux, James Mahoney andJacob Franks rowed a strong back half to take second-place behind Slovenia. With four crews advancing to the quarterfinals, New Zealand and Slovenia led the field after 1,000 meters, with Belarus and the United States just over two seconds behind and Nigeria over 30 seconds back. Slovenia continued to push forward, as did the American boat, which moved into second position in the third 500. Slovenia finished with a time of 6:19.95, followed by the U.S. in a 6:22.59. Belarus and New Zealand rounded out the top four. Long Beach, Calif., natives Allen Reitz and Luke Khoury also advanced to Friday’s quarterfinals after finishing fourth in their heat of the men’s pair. Reitz and Khoury rowed in fourth position the entire way down the course, crossing the finish line with a time of 7:27.29. Great Britain took the lead off the start and maintained the top spot the rest of the race, finishing in a 7:11.12. Switzerland finished second, followed by Canada. The men’s double sculls duo of Galen Bernick and Daniel Holod finished fifth in its heat and now will race in tomorrow’s repechage for another chance to advance. Bernick and Holod were in fourth position 500 meters into the race before dropping off the pace. Australia won the race in a 6:51.81, followed by China, Turkey and Great Britain. The U.S. finished with a time of 7:11.20. Bernick and Holod will take on Estonia, Paraguay, Georgia and Latvia in the repechage, with the top two moving on to the quarterfinals. 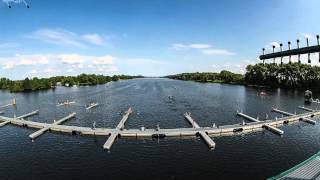 Junior World Rowing Championships heats timelapse, August 6 2014, Hamburg Germany.